Southeast Asians are becoming more aware of the need to address their health issues properly, but the underdeveloped state of Southeast Asia’s healthcare infrastructure, as well as resource shortages, still make these needs difficult to address effectively. In many cases, the cost of building new infrastructure to serve these needs is simply too much for national governments to bear all at once. In the short term, e-health mobile apps are a way to leapfrog these shortcomings and provide better access to healthcare using what Southeast Asians have in abundance - smartphones. These e-health mobile apps currently offer a breadth of services, including telehealth solutions, practice-management products, data aggregation platforms, and consumer health portals. Singapore-based e-health app, Doc Doc, is an example of an e-mobile health app which has been quite widely adopted thus far. Doc Doc essentially enables patients to look up and book a doctor’s appointments in specialised fields with just a few clicks of a mouse. Patients can look up doctors from a drop-down list of Southeast Asian countries, then find out if they have the required expertise to address their medical problem. Should everything be in order, they can then proceed to book an appointment. In addition to the US$18.6 million it has garnered in funding so far; the most recent funding round makes Do Doc the highest funded healthcare startup in the region to date. BookDoc, too operates in the same way, but within a smaller number of countries, developing a wider pool of services within those markets. The company has formed partnerships with Q&M Dental Group, Agoda, Airbnb and Grab, among others, to meet varied patient needs in countries like Singapore, Malaysia, Hong Kong, Thailand and most recently, Indonesia. “We need as many strategic partners as possible to help us achieve our goal, because it means we can leverage on each other’s tech,” said Chevy Beh, chief executive officer and founder of BookDoc. 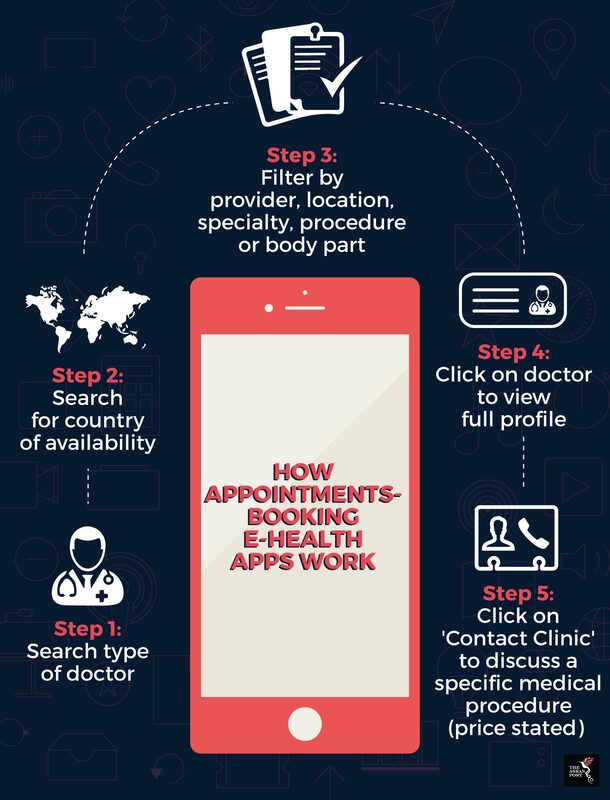 Most of these e-health apps leverage on clinical informatics, artificial intelligence and algorithms to increase search accuracy but such systems could be improved upon with the employment of publicly available electronic health records systems which would allow for better search results. In Southeast Asia, Singapore is the first country to have rolled out such a public electronic health records system, allowing patient health records to be shared across its national healthcare ecosystem. Similar developments in the rest of Southeast Asia have not been forthcoming so far. E-health app solutions do not, moreover at this stage actually help reduce healthcare costs. Tech has still not been able to address complex health issues in the healthcare system, due to the messy, unstructured nature of raw electronic medical records. Making sense of this data would require the use of advanced technologies able to crunch and then analyse this data. At present, this may be the purview of tech companies such as Verily, who have expressed an intention to collaborate with governments, companies and insurers to use tech to identify patients who could benefit from preventive medical care measures. Since prevention is better than cure, the potential to help patients save on high medical bills due to illness is present in that sense. Such developments could be slower to take effect across Southeast Asia as a whole due to underdeveloped internet connectivity, broadband networks and the lack of regulatory frameworks to guard patient data privacy, for now. Yet progress also differs from country to country. Singapore is already implementing the next step in e-health app development, namely remote patient monitoring technology for its aging population. Countries like Indonesia, however, still rely on e-health apps like ApotikAntar and Prosehat to provide them with basic healthcare information. This is necessary for Indonesia’s underserved population, which has a ratio of just one doctor for every 5,000 citizens, according to data from the World Health Organisation. E-health apps are already a reality in the healthcare systems of many Southeast Asian nations today but remain just a small part of the wider digital healthcare ecosystem. Ultimately, the goal of all such health tech solutions is to make healthcare both, accessible and affordable in the region.